Graphic Facilitation 2015 – Skills, Innovation and Fun! 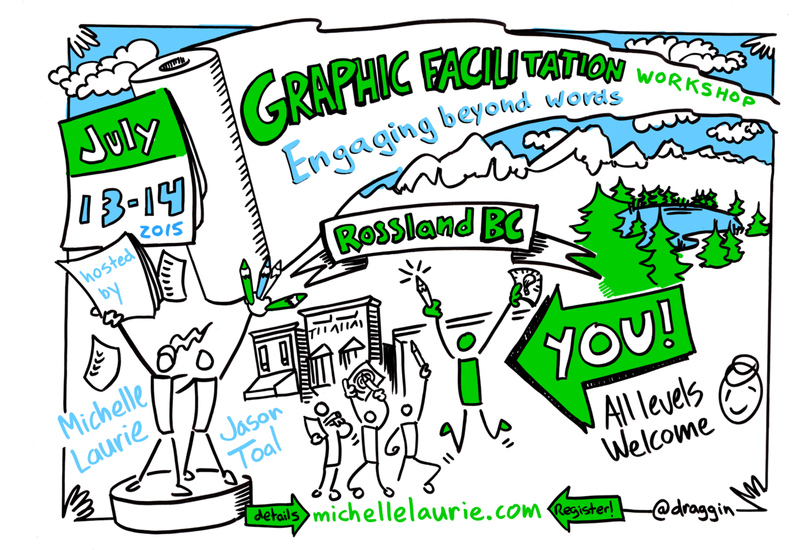 I am very excited to be co-hosting the 6th Annual Graphic Facilitation Workshop in Rossland, BC July 13-14th, 2015. Have you noticed how companies and organizations are using visuals more and more in the way they communicate with customers, employees and communities? Learn the tricks of the trade in two days packed with practical skills, confidence building and FUN! If you are interested in ENGAGING BEYOND WORDS and looking for innovative ways to spice up your practice, this workshop is a fabulous experience. Bring a friend and you both get $50 off! Three people registering from one organization? Bring the fourth one FREE!